FAB QUALITY SIGNED WEBB CORBETT WINE GLASS. THESE ARE THE ODD GLASSES FROM MY GRANDPARENTS MASSIVE CRYSTAL COLLECTION. 5 Stuart Crystal Imperial cut sherry glasses, lovely Art Deco design, ball in stem foot, plain base. 3 glasses are signed under (2 are not), no stickers neither original box. A SET OF FOUR WINE GOBLETS BY EDINBURGH CRYSTAL IN AN EARLY PATTERN. THE E&L MARK IS EARLY 1927-1939. IT CONSISTS OF 4 DEEP CUT OVALS WITH 4 LONG SPEARS BETWEEN THEM. THE BASE IS STAR CUT. THEY WILL BE WELL WRAPPED. MOSER Crystal - Art Deco Slice Cut - Wine Glass / Glasses - 7"
Rim width - 2 1/2". height - 4 1/4". For sale is this wonderful Edinburgh burgh crystal decanter and sherry /liqueur glasses all are in excellent condition. The glasses are almost cocktail style. This is a beautiful and very high quality set of 4 Sundae/Grapefruit Glasses which were made by Start Crystal in England. The Dishes have a very attractive cut glass pattern of vertical lines around the rim and edge and has a row of cut ovals around the middle of the Dish, the stem has Stratford rings. 'Webb England' acid mark to base. Elegant and modern. This clear barware is no longer available on Baccarat website. Iconic lineage.”. Two martini glasses. Original gift box. Price is per set. Swift & Efficient. This lovely Lidded Jar (could be used for sugar or jams or on a dressing table ) is in the design Woodchester with distinctive fern cut design with dots by Stuart & sons England. The design was one of Ludwig Kny's and first released in 1935. Product : Baccarat Crystal Vega Small Ruby Water Glass Number 2. Baccarat history and know-how Its unique bevel cut, designed for Baccarat by Savinel & Roze. The water goblet is available in a variety of vivid colors. Plain speaks elegance. Each piece signed at the bottom. An absolute most for collectors! The presentation is based on the information available to us and to our knowledge. Lausitzer Crystal Burgundy/Ruby Red Cut to Clear Hock Wine Glass 7.5"
SIGNED STEUBEN. WITH ORIGINAL STEUBEN GREY FELTED BAG. signed steuben on each. THIS IS BEAUTIFUL AND FINE PERIOD STEUBEN ART GLASS CHAMPAGNE. 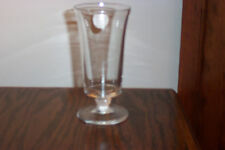 SINGLE CRYSTAL ART GLASS BALUSTER CHAMPAGNE / SHERBET. stunning generous bowl, tapered stem with teardrop bubble, fire-polished finished pontil base. SINGLE CRYSTAL ART GLASS BALUSTER CHAMPAGNE / SHERBET. SIGNED STEUBEN. WITH ORIGINAL STEUBEN GREY FELTED BAG. signed steuben on each. 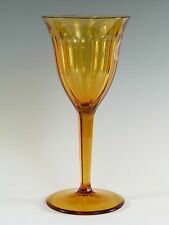 THIS IS BEAUTIFUL AND FINE PERIOD STEUBEN ART GLASS CHAMPAGNE. stunning generous bowl, tapered stem with teardrop bubble, fire-polished finished pontil base. This lovely coupe is in the design Woodchester with distinctive fern cut design with dots by Stuart & sons England. The design was one of Ludwig Kny's and first released in 1935. It is acid etched to the underside of the base with RD 681649 Stuart mark which dates it to 12th March 1921 ( the body shape ). This is a Wonderful Signed Set of Twelve French Baccarat BOGOTA Crystal Shot Glasses & Decanter, ca 1920. The Shot glasses stand 9 cm high and Decanter 30,5 cm high, would be a nice addition to any Baccarat Bogota Pattern collection. Fabulous pair of Webb Crystal, in a design not easily found. They are both in great condition with no chips, nibbles etc. One is etched Webb England, which is 1950/66, the other not. They stand approx 6" tall. The bowls are made in Art Deco fashion and sit on top of faceted stems. Pattern: Byzance by Baccarat. Type of Glass Crystal. Handcrafted full-lead crystal. Color Gold. Hand wash. Glassmaking Technique Hand Blown. CAPTIVATING VAL ST LAMBERT CLEAR CRYSTAL PETULA PATTERN WHITE WINE GLASS 7-1/4"
The glass is signed Val St Lambert. Was most likely sparingly used if so. Pattern: Byzance by Baccarat. Handcrafted full-lead crystal. Hand wash.
Baccarat Crystal Provence Champagne / Tall Sherbet Set of 11. Condition is Used. Shipped with USPS Priority Mail. Heisey Glass Co. #1567 Plantation. 6 5/8" Water Goblet. Heavy pressed. Heisey Glass Co. #1567 Plantation. 6 3/4" Iced Tea Goblet. Heavy pressed.